Honestly, I was expecting them to be quite similar, and was shocked to discover the extreme differences among each of these mozzarella dairy-free soy-free cheese alternatives. So they could be eaten by all of our tasters, we made a quick homemade pizza sauce and used a store-bought gluten-free dough. 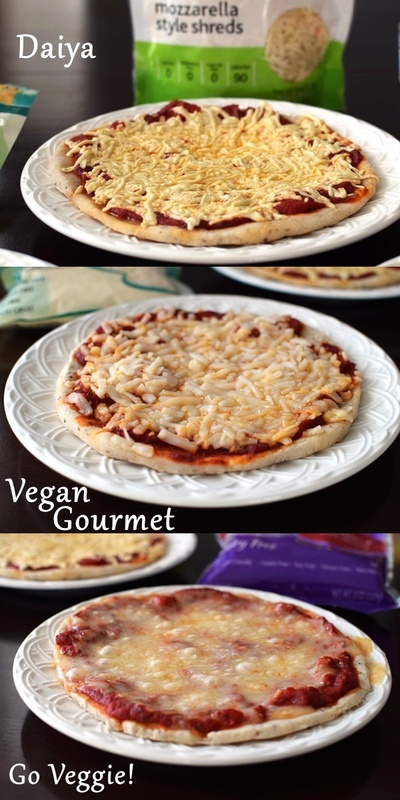 the only difference between the three mini pizzas was the dairy-free mozzarella. Uncooked, we thought these shreds looked the most like “real” cheese and were tops in visual appeal. Cooked, they did seem to melt a bit but had a rather unique “fused” appearance. Fortunately, the shreds melted just enough for a nice cheesy consistency that was a touch sticky, but not too much. Caroline and Tony said this tasted the most like “real” pizza, and we all thought it had a pleasant flavor with a perfectly mild cheesy vibe. 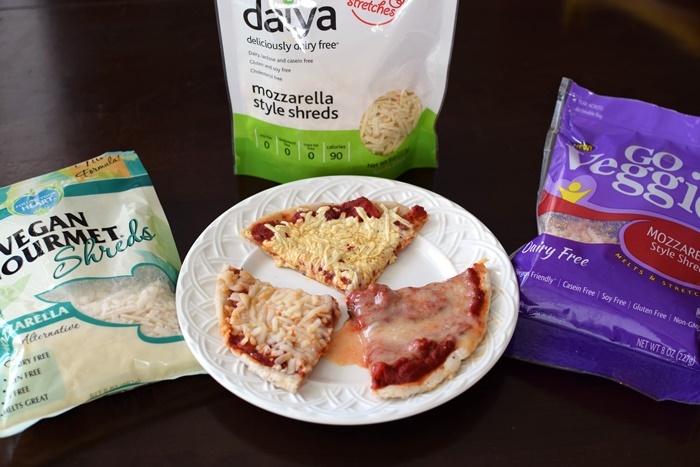 The Daiya pizza was the first to be devoured and two of our tasters went back for seconds! *Daiya Mozzarella Style Shreds Ingredients: Filtered water, tapioca and/or arrowroot flours, non-GMO expeller pressed canola and /or non-GMO expeller pressed safflower oil, coconut oil, pea protein, salt, vegan natural flavors, inactive yeast, vegetable glycerin, xanthan gum, citric acid (for flavor), titanium dioxide (a naturally occurring mineral). Certifications: Daiya mozzarella style shreds are Certified Kosher Pareve. They are labeled as vegan, gluten-free, and using non-GMO ingredients, but we didn’t note certifications for these. I was sure Vegan Gourmet was simply too stubborn to melt. Unlike the other two, the shreds looked pretty much the same, whether raw or baked. But to all of our surprise, the mozzarella had softened significantly, practically dissolving in our mouths like a rich and creamy sauce. 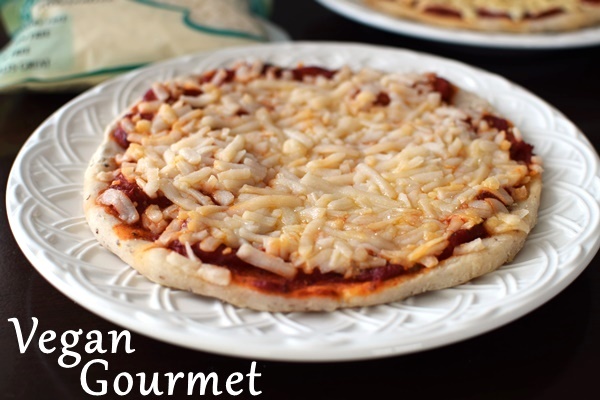 Of the three dairy-free soy-free cheese alternatives, this one tasted the least like cheese – in both flavor and consistency – and it didn’t quite “fit” with the pizza. However, it begged for other callings, like potatoes or pasta – something where creamy, rather than pungent and stretchy, shines. *Vegan Gourmet Mozzarella Shreds Ingredients: filtered water, organic palm fruit oil, modified food starch, natural flavours (plant sources), less than 2% of: pea fibre, pea starch, bamboo fibre, calcium phosphate, rice flour, palm glycerin, sunflower lecithin, sea salt, sunflower oil, carrageenan (seaweed), calcium sulfate, citric acid, microbial enzymes, xanthan gum, disodium phosphate, sodium citrate. Certifications: Vegan Gourmet mozzarella shreds are Certified Kosher Parve, Rainforest Alliance Certified, and Non-GMO Verified. They are labeled as vegan and gluten-free, but we didn’t note certifications for these. As it emerged from the oven, Caroline “oohed and aahed” at the bubbly, perfect appearance of the Go Veggie! topped pizza. Unfortunately, looks can be very deceiving. That enticing topping was in fact a molten pool that literally spilled over when we tried to cut a slice (see the picture below). And though it looks fully liquefied, it’s also insanely sticky (fingers, plates, roof of mouths, etc)! The puddles also caused the pizza crust to end up tremendously under-cooked – nearly raw, in fact. So though the cheese flavor wasn’t bad at all, the texture was unappealing enough that no one finished a full slice. We trialed the shreds a second time in the oven for just a few minutes, but they do seem to go from solid form straight to puddles quite quickly. *Go Veggie! Vegan Mozzarella Style Shreds Ingredients (purple package – NOT the green package): Water, Canola Oil, Cornstarch, Vegetable Glycerine, Arrowroot Starch, Tricalcium Phosphate, Pea Protein, Salt, Natural Vegan Flavors, Rice Maltodextrin, Lactic Acid (non-dairy), Sunflower Lecithin, Xanthan Gum, Annatto (color), Powdered Cellulose added to prevent caking. Certifications: Go Veggie! vegan mozzarella style shreds are Certified Kosher Pareve. 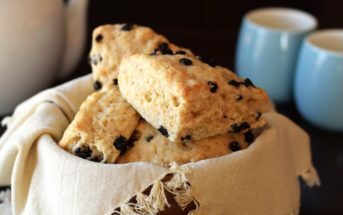 They are labeled as vegan, gluten-free, and non-GMO (they explicitly note that they do not use any genetically modified ingredients, but we didn’t note certifications for these. Our final vote yielded a unanimous result: “Daiya all the way!“, Caroline proclaimed. The rest of us concurred. 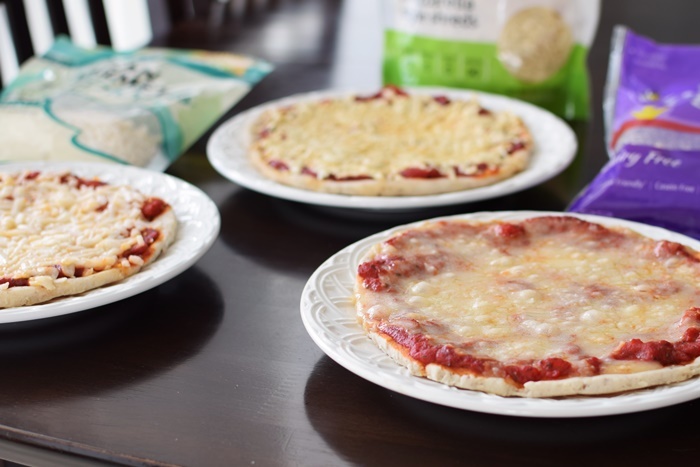 Daiya performed very well in the oven, resulting in the best mouth feel and flavor on our free-from pizzas. 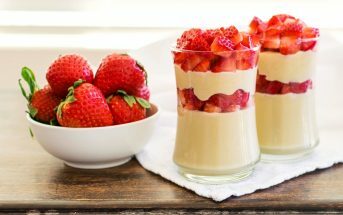 But keep in mind, while they can be a great stand-in in recipes, these dairy-free soy-free cheese alternatives don’t taste just like cheese. However, as one tester stated, “they have their own deliciousness”. *Note that I do not typically put ingredients on product reviews as ingredients are subject to change at any time. I’ve only done so on this post for comparison purposes of these dairy-free soy-free cheese alternatives. Always check the packaging ingredients before consumption and contact the company directly if cross-contamination is a concern for you. My daughter is lactose-intolerant. We are yet to find LF cheese she will eat. Thank you for this article I will see if she likes it. But I do have a question…she drinks LF milk…it tastes just like milk, because it is milk. Does anyone make LF cheese using LF milk? Yes, Go Veggie has a line of lactose-free cheese, as do a couple other brands. Trader Joe’s also sells some. I have not found a non dairy cheese that does NOT have xanthum in it! Does one exist??? he loves cheese! Please advise!! Hi Suzie, I know that there are brands, I just can’t name them off the top of my head! I would keep an eye out on the nut cheeses and consider homemade instead. My daughter’s 6wk. old son was just diagnosed with a milk protein allergy. My daughter is breastfeeding. She was told she needed to go on a non dairy, no soy diet. Alisa does your book address both of these issues? Any help on easing this transition for her would be much appreciated. As if being a first time breastfeeding mom isn’t taxing enough! PS mom goes back to work, full time, in 6 weeks!! Hi Aline, I’m so sorry for my delay! 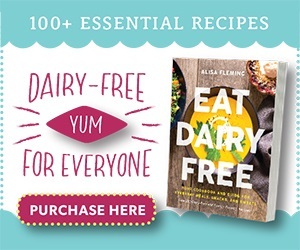 My new cookbook, Eat Dairy Free, has soy-free options for every recipe (most of the recipes are naturally soy free). And of course it’s dairy-free too! 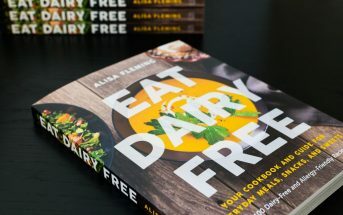 The 2nd edition of Go Dairy Free (due out in June, but on preorder now), is for anyone cutting out dairy. It’s a full guide. 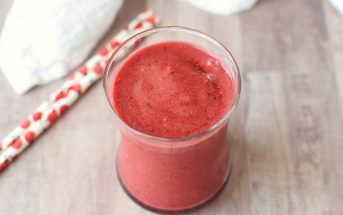 As for the recipes, most are soy free (there are 250 recipes in total, so much to choose from! ), and there is an allergen quick guide. Only a few recipes in there use soy that don’t have a soy-free option. I came across this post while in search of a vegan cheese WITHOUT CELLULOSE, which is SAWDUST! That’s so disgusting. They say it’s to “prevent caking” but i couldn’t care less about that. I would SO much prefer my food to be whole and healthy than to look nice in the package. What about the carageenan in the daiya cheese? Doesn’t this concern anyone? My son has a thyroid disease (autoimmunie) and this stuff isn’t good for him. Hi Rachel, I just looked at a package of Daiya shreds and it has no carrageenan. I’m pretty sure they’ve been phasing it out for a while now. Like to see two of my favorites stack up against daiya. I like Julian bakery cheese toasted on their breads. I also LOVE lisanatti Shreds. I haven’t tried the Julian bakery cheese, it looks interesting! 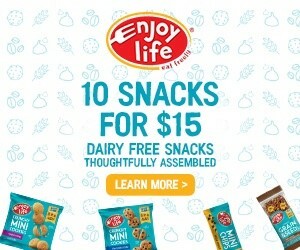 It will definitely be different from Lisanatti as that brand isn’t dairy-free, milk protein is a main ingredient in it. Paleo Cheese® 0.88 lbs Large Block (2 Pack) (Dairy Free) – Just read this has Titanium Dioxide as an ingredient, which is used in sunscreen and makeup. I wrote the company and told them my thoughts and they sent 2 free coupons for me to try something else. Your review of these products is not encouraging 🙁 But thank you! Well, I do have some good news. Daiya has a new line of “Cutting Board Shreds” coming out and they are night and day from the others. Had them on nachos and a pasta casserole and they were surprisingly good! They melted, stretched, and had good flavor. They will be a separate line from their original shreds (which they will still sell) and specifically will be called “Cutting Board”. I had a sneak preview, but they’re supposed to start appearing in stores in May. 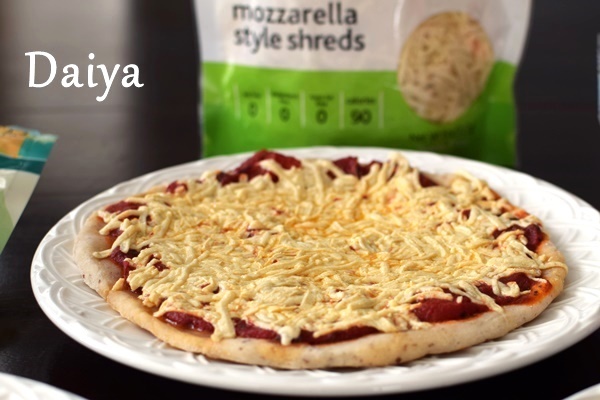 I love Daiya shreds fo pizza, nachos, and more! 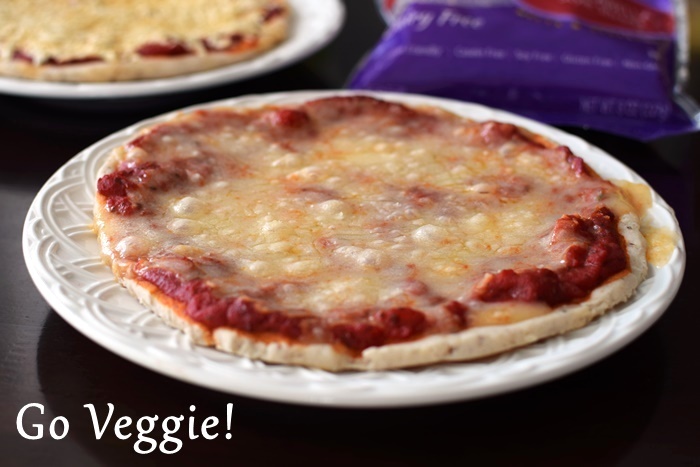 And their ready made pizzas are great, too! The Daiya Shreds in Mozzarella are great for lasagna. They don’t melt like “normal” cheese but they do get soft and gooey. My 4 year olds loves them. Thanks for sharing this Mandy – I haven’t tried them in lasagna yet! I’m wondering if mixing the three brands would lead to a better flavor and texture? After years of being disappointed in store bought dairy free cheese, I began to make my own. The non dairy mozzarella cheese is so good its great with crackers. This is the book I use, The Non-Dairy Formulary: Vegan Cuisine for the Ethical Gourmet. If you liberally sprinkle nutritional yeast on top of the sauce, then cover that with the Daiya shreds, bake and then drizzle a little lemon juice on the pizza, you’ll think you have real cheese. I make a version of pasta primivera with the mozzarella style shreds and vegan buttery spread that my non-vegan son loves, but it needs that nooch and lemon juice to get more real cheese taste. Brilliant! Thanks for sharing this tip Nancy! I LIVE IN COLORADO SPRINGS, CO. MY DR. IS A SPECIALIST OF PENROSE HOSPITAL. I BUY 32OZ CHEESE AND THE LARGE PACKAGES OF SHREDS AND THIS IS WHAT MY DR. SAYS I CAN HAVE FOR DAIRY FREE. IT HAS BEEN PROCESSED SO MANY TIMES NO LACTOSE LEFT IN IT. ALSO, MY DIETICIAN SAYS I CAN DO THE SAME. I EAT SO MUCH CHEESE YOU WOULD BE SHOCKED BUT I HAVE BUILT UP MY PROTEIN AND NO LONGER ENEMIC. I EAT CHEESE OR MEAT THREE MEALS A DAY. My family also had searched for a good df/gf/sf cheese alternative. Daiya is the best we’ve found. I think you nailed it. Some of the others have strange flavors and a grit to them that just doesn’t make the grade. Fondu is great with daiya, pizza, hotdish (casserole)…Mexican. Now that there are slices grilled cheese it’s a breeze.